Author Lalita Tamhane was studying in school then when her Uncle’s friend a palmist looked at her hand and predicted that as you grow up in age you (Lalita) would be an author of several books. Little did Lalita knew that those startling predictions would one day really come true? Today, it’s matter of pride that Lalita Tamhane is an eminent journalist who has come up with her sixth book titled “Chanderi Soneri” as published by Maitreya Prakashan. “Chanderi Soneri” Kalakaar Mulakhati Palikadech as the title goes the author has covered around 18 notable personalities ranging from Meena Kumari to Madhuri Dixit. A celebrity is not something that is restricted just to tinseltown it could be anyone for that reason from arts or corporate world. With her interactions with the personalities the author has tried to get the pulse of each one of them from closer angle and she has been instrumental to amplify her experiences with these celebrities by putting words to paper. 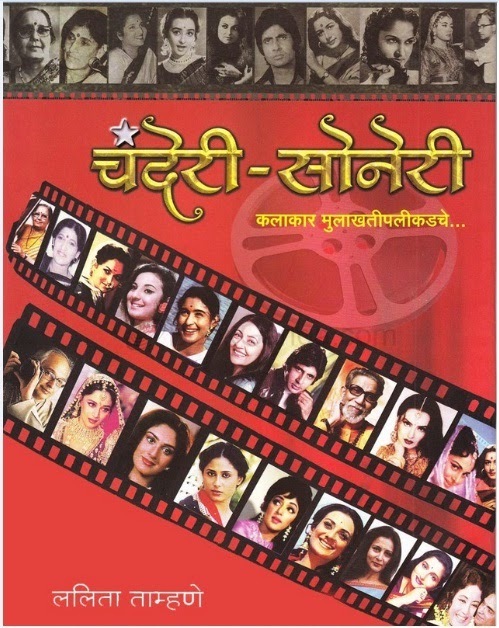 The personality covered in this book includes Kamal Amrohi, Saira Banu, Waheeda Rehman, Nutan, Tanuja, Smita Patil, Deepti Naval, Amitabh Bachchan, Madhuri Dixit, Manik Verma, Kishori Amonkar, Anuradha Paudwal and Gautam Rajadhyaksha. Her interactions or experience with the celebrities the author has captured it very well in the form of interesting anecdotes. One interesting anecdote covered here is that of Amitabh Bachchan while he got himself hurt in the midst of an action shoot taking place in a shopping center at Juhu while the author Lalita had come down to meet him over an interview. Amitabh’s nose got hurt, swollen and was bleeding profusely. When the time was scheduled Amitabh called the author Lalita Tamhane inside his vanity van to give the interview. In spite of being hurt he could have always cancelled the interview and kept it for some other day but Amitabh did not. Reason, he knew Lalita had a deadline to meet for the interview for the publication and Mr. Bachchan wanted to ensure that she does not skip on her deadlines just because he got hurt during the action shoot sequence. That’s the benchmark of professional commitment Mr. Bachchan keeps. What intrigued me is the fact that apart from Bollywood the author has also covered notable personalities like Balasaheb Thackeray, India’s leading fashion photographer Gautam Rajadhyaksha or singer Kishori Amonkar who were not actor or actress then why did they get the space in this book. My conversation with the author Lalita revealed that one must understand the sub line of the book “Chanderi Soneri” Kalakaar Mulakhati Palikadech. So when we talk of Kalakaar or an artist the individual can be anyone related to arts not necessary the person needs to be an actor from Bollywood. A reply that was very apt I must admit going with the title of the book. Here’s wishing Lalita Tamhane All The Best for her future endeavour. I am positive readers would find reading the book covering these notable personalities indeed enlightening.